HP 70 ink cartridge is designed for use with HP Designjet Z2100, Z3100, Z3100ps GP, Z3200, Z3200ps, and Z5200. HP Vivera pigment inks are specifically engineered to deliver consistent results every time you print. Carefully selected ultra-pure pigments and exclusive ink formulation technology ensure that pigment particles remain evenly dispersed and ink flows freely. This prevents settling and clumping of particles that can clog printhead nozzles and cause inconsistent print quality. HP Vivera pigment inks take the hassle out of getting brilliant, vivid color that you can repeat print after print. 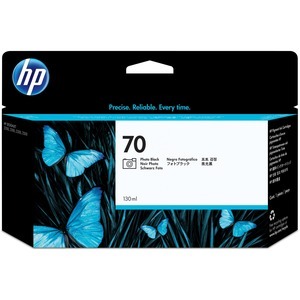 HP 70 Ink Cartridges are designed for reliable, cost-effective printing. When it's time to replace a cartridge, individually replaceable ink cartridges allow economical replacement of only the cartridge that is out.